Kalimpong, Mukesh Sharma: Early Tuesday the Lepcha para-teachers on an indefinite dharna in front of the Sub- Inspector of School office here shifted venue to Triangular Park as the administration continues to give a heed to the protesters. Thirty three out of the forty six teachers who had received appointment letters on April 1 but were not allowed to join in different primary schools have been in protest mode since April 20. By shifting to Triangular park, the protesters feel, will allow them more exposure and catch attention of the public eye which unfortunately does not happen in the present venue. “The SI office is away from the town area and the place is odd. Since the dharna has not been effective so far we feel it is necessary that it gets public attention,” rued Robert Lepcha, one of the protesters on Tuesday. The dharna which started from April 20 was being carried out from dawn to dusk every day. However with the shift of the venue the protestors will sit 24X7 agitating added Robert. 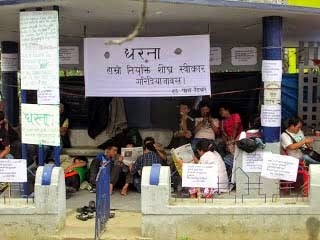 The protesters during these 15 days protest is believed to have braved the terrifying quakes and its aftershocks that followed unseasonal rainfall in the hills. “Most of the protesters went sick but the administration gave in a deaf ear,” said Robert. The protest comes on the close heels of a spat between the GJM ruled Gorkhaland Territorial Administration (GTA) and the district administration over right to conduct the interview process for the teachers who would be entrusted for teaching Lepcha language in hill primary schools. The spat turned legal with the matter remaining subjudice as the GJM filed a case against the administration in the Kolkata High Court. The GJM is of the opinion that since primary education is a transferred subject, the interview process should have been conducted by the hill body and not the administration. Bimal Gurung, the GTA chief interestingly has now demanded or proposed para teachers for 11 other local languages. “That is a noble thought from the GJM chief and if people from all quarters come upfront for it we will definitely support,” said Robert reacting to the GJM’s proposal. The Lepchas believe that the spat between the state and GTA is only hampering employment in the hills. Lepcha para-teachers on an indefinite dharna in front of the Sub- Inspector of School office here shifted venue to Triangular Park as the administration continues to give a heed to the protesters.